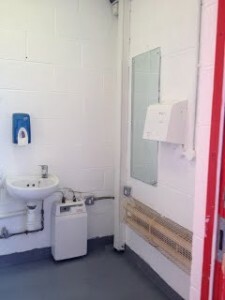 Members of the Exeter City Disabled Supporters Association (ECDSA) gave a repaint to the disabled toilet inside St James Park, thanks to funds raised from their bucket collection at last season’s Devon Derby fixture against Plymouth Argyle. Every match day, Exeter City Football Club host bucket collectors from different charities and other organisation’s who fundraise for their causes. In the past, money raised by ECDSA from a bucket collection has been used to fund five sets of waterproofs for wheelchair users on match days, two evacuation chairs for ‘the park’ and Radar key locking systems for the disabled toilet inside the stadium and ‘the park’. 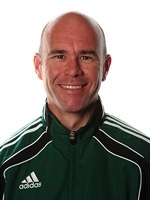 In the last couple of months ‘Premier League and FIFA World Cup assistant referee’ Mike Mullarkey became an ambassador for the association. They only cost £12 but the newly erected grab rails at the back of the WTS stand have made entering and exiting the stand much safer for fans. During the close season ECDSA were approached by season ticket holder Martin Robertson who sits a few rows from the back of the WTS stand. We’ll let Martin explain, he told us “I’m not so steady on my feet these days and use a walking stick due to arthritis in all my joints and I’m finding that my mobility is becoming a challenge on a daily basis. At the back of the WTS stand nearest to the Big Bank is an entrance door that leads to the hospitality facilities. 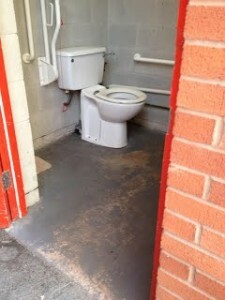 Just inside this door is a disabled toilet and when nature calls, usually at half time, this facility helps me greatly. I was finding it more and more difficult to get through the door and back to my seat safely and thought that if a couple of grab rails were erected either side of the entrance then this would make things much safer for myself and others. I’m delighted that ECDSA have acted quickly by supplying and arranging with the club to get these grab rails fitted in time for the start of the new season”. 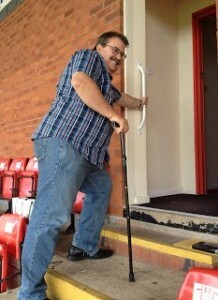 Nick Saunders – ECDSA chairman said “This is a great example of how we at ECDSA can improve the match day experience for all disabled fans. On this occasion the cost was small but the benefit of a safer passage for Martin and others to and from their seat has been huge”. “Sorry we can’t improve results on the field”. Monies raised from this year’s bucket collection will be used to provide further windbreak protection for wheelchair users, using areas 6 & 7 in front of the Big Bank. The windbreak can also double as an advertising board, so has a dual benefit. Chairman Nick Saunders said “This is a fantastic amount to have raised in just 10 minutes during half time. On behalf of ECDSA, I would very much like to thank the supporters of the club for their overwhelming generosity together with all those who gave up their half time cup of tea to undertake the collection”. ECDSA Ambassador Mike Mullarkey said ” Well done to everyone concerned with the bucket collection. Can’t be easy, given the lower crowds and general state of the economy to get people to part with their cash, so great effort from all of you”. In August 2013 ECDSA launched the ‘Breaking Wind at the Park’ project. Working with the club, permission was given to erect a windbreak at the front of wheelchair area 2, which is situated at the front of the WTS Stand close to the half way line. When the wind blows across the pitch it can get mighty cold and wet in those bays without some protection. Wheelchair area 2 mentioned above, is now being sponsored by ECDSA and the windbreak on the front of area 3 is sponsored by Pluss of Exeter. Don’t forget that there is still a number of other bays around the ground which could benefit from a windbreak so there is still an opportunity for other companies to come forward. If you are interested and would like to help to ‘break wind’ at the Park then get in touch with the clubs commercial team by emailing: commercial@exetercityfc.co.uk or ring 01392 411 243. 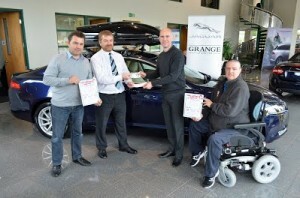 Exeter City Disabled Supporters Association Officially Launch Grand Christmas Draw 2014 took place on Wednesday 8th October at the Grange Exeter, located down at Matford in Exeter and who have once again kindly provided a major prize of a top of the range XF Jaguar car for the weekend. ECDSA Ambassador – Mike Mullarkey, together with ECDSA Chairman – Nick Saunders officially launched this year’s Christmas Draw in the company of Stuart Doderer of greenmybusiness.co.uk and Alistair Mills of the Grange where the first book of draw tickets was sold. Alastair Mills said ‘We have supported Exeter City in many guises over the years but we have always had a close link to ECDSA. The invaluable work put in by a few is enjoyed by many now, and for the years to come, no matter what the results are on the pitch! We think the 1st prize for the draw is that good we bought the first 6 books of draw tickets ourselves’. Stuart Doderer said ‘Getting into the stadium safely, enjoying a good position and a great view when City play is important for all Exeter fans. We’re delighted to be supporting the ECDSA Christmas Draw to help them improve the disabled facilities at St James Park’. This year we’re joining forces with the Exeter City Supporters Trust and Exeter City F.C in selling draw tickets and we’ll be splitting the amount raised 50/50 with them under ‘Dig Deep for City’. 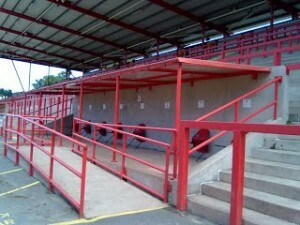 Money raised in the past has gone towards providing the club with a Portable Induction Loop for the hearing impaired; Roofing put onto Disabled Area 7 in the Big Bank Stand; 16 removable chairs for Personal Assistants using areas 6 & 7 in the Big Bank; two wheelchairs, which are for hire on match days and two evac chairs used in ‘the park’. Jaguar for the weekend (conditions apply) Courtesy of the Grange of Exeter. Night’s stay with Dinner & B&B at the Deer Park Hotel near Honiton (donated by Greenmybusiness.co.uk). Blu-Ray Player with 5 Blu-Ray films. 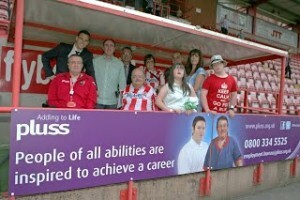 Match Day Hospitality for 2 and Signed ECFC Football (both donated by Exeter City F.C). ECFC Book: ‘Have you ever played Brazil?’ (Signed by Aidan Hamilton). Fair-Trade Christmas Hamper.Electric Tile Cutter (donated by Original Style). Digital Camera (donated by wwutilities). Subway Vouchers (donated by Subway, Sidwell St, Exeter). Complimentary 4 ball Golf vouchers for St. Mellion and Trevose (donated by Midas). ECDSA would like to take this opportunity to thank all those who have kindly donated prizes to this year’s draw. The draw takes place at ‘the park’ Exeter City F.C on Wednesday 10th December, 7pm and winners will be contacted on the night, shortly after the draw. 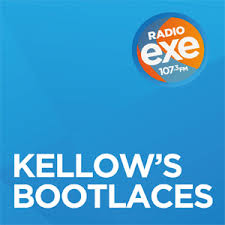 On Monday 24th November ECDSA Chairman Nick Saunders and ECDSA Ambassador Mike Mullarkey together with City striker Graham Cummins featured on Kellow’s Bootlaces the Radio EXE (107.3fm) radio show. Presented by Graham Kirk (Kirky) & Barry Fulls (Fullsy) the show brings listeners up to date with goings-on at St. James Park. 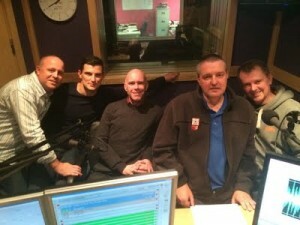 This hour long programme on Radio Exe is dedicated to Exeter City, with interviews, features and competitions. Nick was entrusted with the task of reading the weather forecast as the show started and later took the opportunity to talk about ECDSA and promote the Christmas Draw whilst Mike told everyone why he took up the ECDSA Ambassador role earlier this year. 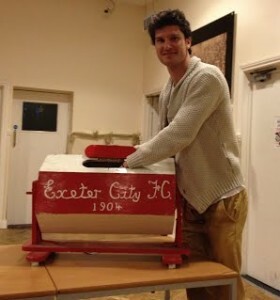 EXETER CITY DISABLED SUPPORTERS ASSOCIATION’S Christmas Draw took place on Wednesday 10thDecember 2014. The draw was attended by City player Pat Baldwin, Pat is also President for our association and Elaine Davis who is a Trustee and Exeter City Football Club Trust Director and behind ‘Dig Deep for City’ campaign. We are very proud and pleased to announce that a sum of £1590 has been raised from the draw with 50% of the profits going to the Supporters Trust ‘Dig Deep for City’. On Saturday 13th Dec we handed over a cheque for £719.27 to ‘Dig Deep for City’ and we’ll be using our amount to help improve disabled facilities at St James Park for supporters with disabilities. We would like to thank all those who so kindly donated prizes for the draw including:- Grange of Exeter; GreenMyBusiness.co.uk; Midas; Subway of Sidwell Street; Original Style Tile Superstore; Wales and West Utilities, Exeter City Football Club; ECFCDSA current and past committee members together with everyone who purchased draw tickets. A big thank you to the Supporters Trust; East Devon Grecians and the Supporters Club and others for kindly selling draw tickets on our behalf and helping us raise a fantastic amount. 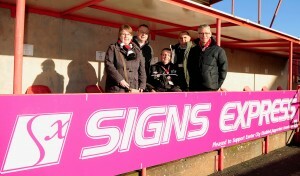 ECFCDSA chairman Nick Saunders said “Our Christmas draws are our main fundraiser of the season, However without the support of local business and individuals ECFCDSA could not achieve as much as iwe do in helping to make the match day experience at Exeter City so much better for all disabled supporters. This year we’ve raised a fantastic amount and we’ve also been able to help our football club via the Supporters Trust ‘Dig Deep for City’ campaign as well as ourselves – Thank you everyone for your kind support”. ECDSA are delighted to announce that its ‘Breaking Wind at the Park’ project has been completed and that all 5 wheelchair bays at St James’ Park now have protection from the cold wind which often blows across the ground on match days. The latest wheelchair bays to benefit from a wind breaker are those situated in front of the Big Bank stand and the bay used by visiting fans in the WTS stand. 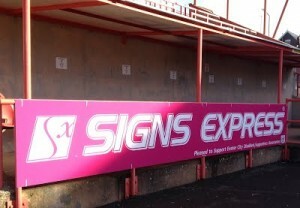 ECDSA wishes to thank both Signs Express and The Trust for sponsoring these bays which now bear their names. ECDSA would also like to thank Pluss of Exeter and Signs Express again for sponsoring two of the wheelchair bays in front of the WTS stand. Don’t forget ECDSA is currently sponsoring wheelchair bay (area 2) which is situated at the front of the WTS stand close to the half way line where you will always find ECDSA members on match days. Please visit us to say hello or to discuss any aspect of ECDSA including how ECDSA can help improve the match day experience for disabled fans. 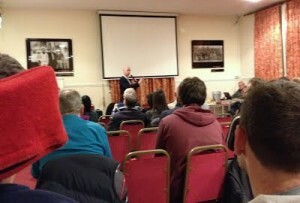 The evening was skilfully chaired by Andrew Barge whose first task was to delay the kick off by 15 minutes. Sadly there had been two very serious road traffic accidents during the day and the roads in and around Exeter had been brought to a standstill. The short delay ensured that late comers did not miss any of the highly entertaining and informative evening that followed. So as a near capacity crowd of 80+ gathered in the Apple Taxi Suite at St James’ Park, Martin Weiler from The Supporters Trust, got the evening going with a multi media presentation all about the history of ECFC and the club’s famous trip to South America in 1914 when ECFC became the first team to play Brazil. Martin’s presentation was full of fascinating facts about the club with pictures and information from that famous trip – for example you may have thought that ECFC was founded in 1904. Indeed the club celebrated its centenary with a game against the Brazil Masters in 2004 here at the Park but following research into the club’s history by The Trust it is now known that St Sidwells Football Club, which was founded in 1901, changed its name to Exeter City in 1904. No new club was formed in 1904 and therefore there may be a move to change the club’s date of formation from 1904 to 1901 – watch out for more news on this from The Supporters Trust. Following the half time interval Andrew then introduced our guest speaker for the night – FIFA World Cup Final 2010 Assistant Referee and ECDSA Ambassador Mike Mullarkey. And what a highly entertaining second half we had with Mike charting his rise from Under 13 ECFC hopeful to League 4 footballer (that’s Exeter & District Sunday League) to non-league linesman, Football League Assistant Referee and all the way through to Premier League and FIFA Assistant Referee. Along the way Mike told the captive audience many amusing stories and anecdotes about his time running the line leading up to the 2010 World Cup Final and beyond. Mike talked about how lady luck always plays her part in any success story. Remember the game in the 2010 World Cup – England trailing Germany 1-2 when Frank Lampard shot from outside of the box. The ball hit the crossbar, bounced down behind the line but bounced back out and into play. No goal was given although the ball was clearly over line and England went on to lose the match 1-4. With England out of the World Cup an opening for the England officiating trio of Howard Webb, Darren Cann and Exeter’s Mike Mullarkey appeared and the rest is history so they say. Had the goal been given and England, who were in the ascendancy at the time, went on to win the game then our England trio may not have been given another match to officiate. Mike finished off by inviting questions from the audience and diplomatically answered questions on time wasting, yellow & red cards, the ‘sin bin’ and many more. Surprising though no one asked Mike to explain the off-side rule – a good job because we all had homes to go to! Mike had brought with him a number of items of memorabilia from his time as an Assistant Referee and these were on show for all to see including his medal for officiating in the 2010 World Cup Final which was the same medal given to the World Cup winners. 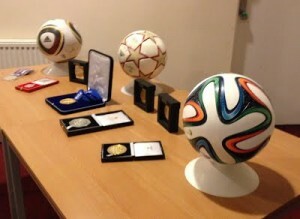 Mike had also given to ECDSA a number of high quality items to raffle off from the football world. The raffle together with a retiring bucket collection raised an impressive £275.33 for ECDSA funds all of which will be used to help improve the match day experience for disabled supporters here at St James’ Park. ECDSA would like to thank Mike, Martin and Andrew for helping us put together a wonderful evening of entertainment and all those fans who attended for making the evening such a success. 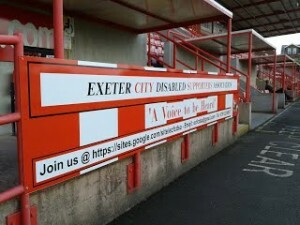 Chairman of the Grecian Group Forum – Andy Gillard said “This year’s Grecian Group of the year is the Exeter City Disabled Supporters Association, succeeding the EDGs who were last year’s inaugural winners”. Andy went on to say “This is down to their overall support for the club but essentially the Association’s continuing sheer hard work to finance the work and support all those things that make SJP a better place. 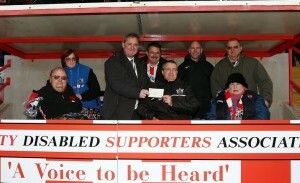 The Disabled Supporters Association are worthy winners”. 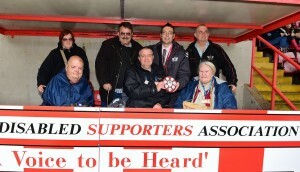 ECDSA committee members were presented the award at the Daggers game on Sat 2nd May, 2015 before the match. 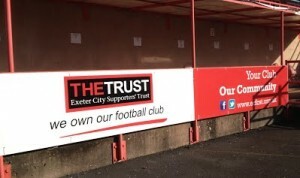 Our Chairman – Nick Saunders said ‘This is a proud moment for our association and this has really made our year and we thank everyone at the Grecian Groups for their support of our disabled supporters association and helping us to continue to do what we do for all those with disabilities and Exeter City Football Club, thank you all again’. Members have been voting again for the player whom they believe has improved the most over the season. This year’s winner is someone who bears the name of one of England’s greatest players. Making his debut for City in the 2012/13 season, this player now commands a regular first team place. A solid and dependable centre back just like his name’s sake. This player is improving and getting stronger with every game. He has had an outstanding season despite suffering 2 metatarsal foot injuries in the first half of the campaign and is a worthy winner of our award. The left-footed defender proved started life in the first team as an adept full-back and made 9 senior appearances for the Grecians in his first year as a pro in 2012/13. His first appearance for the club came against Championship side Crystal Palace in the first round of the Capital One Cup where he faced former City left-back Dean Moxey he himself a former winner of the Most Improved Player award back in 2008/9. In 2013/14 season Jordan went on to make a further 30 appearances in all competitions scoring his first senior goal in a 1-1 home draw with Cheltenham in April 2014. During the 2014/15 campaign Jordan has become a regular centre back and has achieved another 27 appearances despite being sidelined with injury on 2 occasions, He also scored a further 2 goals. 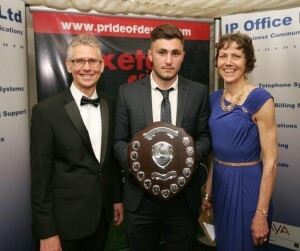 Jordan was presented with his award at the ‘Casino Royale – Gala Ball’ on 3rd May by ECDSA members Trevor & Sue Harwood. We would like thank our members for voting in this year’s competition but if you missed out don’t worry as there will be another chance to vote at the end of next season. Hello & welcome to this the 8th Annual General Meeting of the Exeter City Disabled Supporters Association and the following is my report. The 2014/15 football season was a very busy one for us all and I was glad of the summer break to recharge the batteries before another season of highs and lows. Last season did end on a real high for our association as we were named Grecian Group of the Year for 2015 and we were presented the award at the last match of the season by Grecian Group Forum chairman Andy Gillard. Andy said “This year’s Grecian Group of the Year is the Disabled Supporters Association, succeeding the EDGs who were last year’s inaugural winners. This is down to their overall support for the club but essentially the association’s continuing sheer hard work to finance the work and support all those things that make St. James Park a better place. They’re worthy winners”. We’ve continued to grow our ties with other supporter groups and our award win from the Grecian groups is proof of this. The East Devon Grecians continued their support of our group by continuing their membership and we had great support from the East Devon Grecians; Supporters Club and Supporters Trust with our Grand Christmas Draw. Also not forgetting our work with the ‘one game, one community’ group. Membership is at a steady level of just under 60 members. We’ve still got high hopes of getting over 100 members which could be achieved if members asked their follow footballing friends to become members. It’s sad to report though that in the last 12 months, 6 members have sadly passed away. Ambassador: As mentioned at last year’s AGM, England Premier League & FIFA Assistant Referee Mike Mullarkey became our ambassador and over the past year Mike has helped us greatly in letting people know what we’re all about. Mike kindly donated a fair few items for a raffle on the night of our social event namely, ‘Game of Two Halves’ which included a media presentation ‘The Day we played Brazil’ presented by Martin Weiler on behalf of the Supporters Trust and a fantastic talk by Mike about his career. Turnout on the night was near 70 people, which was fantastic with the major traffic problems in and around Exeter that day. Thank you Mike Mullarkey; Martin Weiler and our MC on the night, Andrew Barge for helping to make the evening a great success. Mike also helped us launch our Grand Christmas Draw down at the Grange garage and even got me and himself onto Kellow’s Bootlaces on Radio Exe which was very nerve racking but I did well in reading the Weather out at the start of the show. Mike kindly donated a referee’s shirt signed by the England Officials at the 2014 World Cup Finals in Brazil. The football club kindly auctioned the shirt at the end of season ball. Amounts raised to come from Trevor very shortly. Thank you Mike for being a great Ambassador. President: Pat Baldwin was our president last year and we thank Pat for his great support of what we’re doing here at ECDSA. Pat has now sadly left the club and we’re now in the process of looking to appoint a new President. 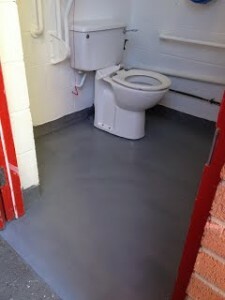 Toilet renovation: Committee members repainted the disabled toilet within the stadium thanks to funds raised from one of our bucket collections. 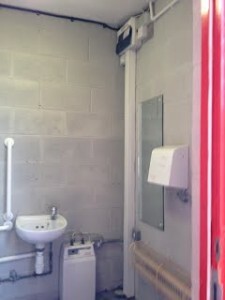 Hand rails: We bought a set of grab rails which have been fitted to the outer door frame to the red door at the back of the Main Stand (WTS) to gain access to a disabled toilet just inside this area. This now makes it easier to get in and out of this door for those who were finding it hard to access the toilet. Bucket collection: The football club kindly gave us the Mansfield Town game for our annual bucket collection. We decided that the money raised would help us add more windbreaker boards to the Big Bank wheelchair areas 6 & 7 and area 4 used by away supporter’s in the Main stand. However, after the collect had taken place the Supporters Trust asked if they could put their own board onto area 7 and Signs Express asked if they could put boards onto areas 4 & 6, which both kindly did. Thanks must go to Bernadette Coates, then, of the Supporters Trust and ECDSA member and Nick Baxter-Sibley of Signs Express for making this all possible and these windbreaker boards have made a massive improvement to the match day experience to those using the areas. This meant that the money raised from the bucket collection will be spent on something else and fans will be informed of what this money is used for when we do. Now with all the areas with windbreaker boards added to them, this means we’ve completed our ‘Breaking Wind at the Park’ project. In the last week the club has kindly given us a date for our bucket collection for the coming season, which will be taking place on Sat14th Nov vs. Crawley Town. Level Playing Field membership: We continue to be fully paid up members and this ensures we get the advice and support we need to sort out any disability issues which we’re unable to do so ourselves. Grand Christmas Draw: Our draw this time around was our best ever and again we had some fantastic prizes up for grabs and this was only made possible with the fantastic support and donations from local companies and our thanks goes to them all and also our committee members and our football club for their donations. For the first time our ambassador – Mike Mullarkey, together with myself; Stuart Doderer of greenmybusiness.co.uk, who also named us their Christmas charity for 2014 and Alistair Mills of the Grange, officially launched the Christmas Draw with Alistair buying the first book of draw tickets down at the Grange. We joined forces with the Supporters Trust and we split the profits from this draw 50/50 with them under their ‘Dig Deep for City’ campaign. Thanks goes to the East Devon Grecians; Supporters Club; Supporters Trust and individuals in helping us sell tickets and making the draw a great success. Most Improved Player award 2014/15: Our members voted for whom in their eyes improved the most in the season and the award was presented on our behalf at the clubs end of season ball by Trevor & Sue Harwood to a worthy winner in Jordan Moore-Taylor. Match day accessible parking: We continue to allocate accessible parking on behalf of the football club. This ensures that all spaces we have are used on a match day by those with disabilities and in the past season we used every space for every match. 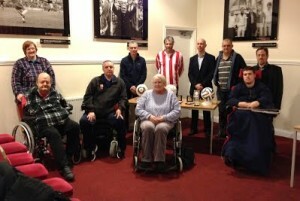 Our association is still heavily involved with the South West Disabled Fans’ Experience Forum as founder members. Last year’s forum which was in its 4th year took place down at Plymouth Argyle in Oct 2014 and it was another great success. Plans are afoot for the next forum, which is being held this time at Cardiff City on Thursday 15th October this year. Exeter City has announced a brief of what the clubs plans are for their redevelopment of the Old Grandstand. 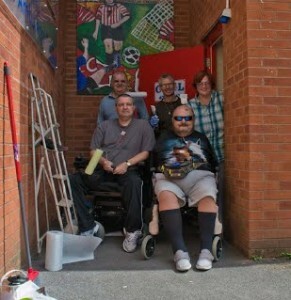 The last time the club was looking at redevelopments we as a disability group presented the club with a Wish List of what we would like to see included in any redevelopment. We’ve gone back over and re-worked our list going on what the club have already informed everyone about and this list has been handed to the club. The redevelopments will be at no cost to the club and we would like to think that everything we’ve put down into our list will be given, as over 60% of what’s included the club has to cover through the Green Guide and Accessible Stadia Guide and the club truly understands this is the case. Jeanne Jones is our nominated redevelopment representative. The football club will be showing their outline plans for redevelopments at two public consultations at the club start on Friday 24th July from 2pm to 7pm and ending on Saturday 25th July from 10am to 1pm. If you can get along to one of these dates please do so and show your support. There are some areas and issues I need to look into as the clubs Disability Liaison Officer and this will be reported to our committee once I’ve got something to report. I hope as your chairman I’ve continued to do what is expected of me and if re-appointed I’ll ensure that all supporters with disabilities and their personal assistants are treated fairly and with the support of the committee, ensure the club are kept on their toes on disability issues, as you would expect. I’ll also ensure that we continue to do our bit in helping and supporting Exeter City Football Club in any way we possibly can. 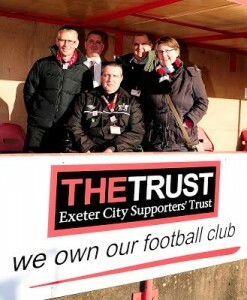 Finally, I would like to thank our committee for all their hard work and time given for the benefit of our members and Exeter City over the past season. Mike Mullarkey and Pat Baldwin for their hard work and support for our association and our members for their continued support and to Exeter City Football Club for allowing us to use their facilities, again for free for our meetings and to all of you for attending this year’s AGM. Thank you all for your continued support and for listening.